I am often asked by fellow creatives how I combine minimalism and creative life. Are creatives not supposed to be "messy"? I am a big believer in the power of contrast and contradictions, which is probably why minimalism helped me gain clarity, joy, focus and fulfilment in both my personal life and work. 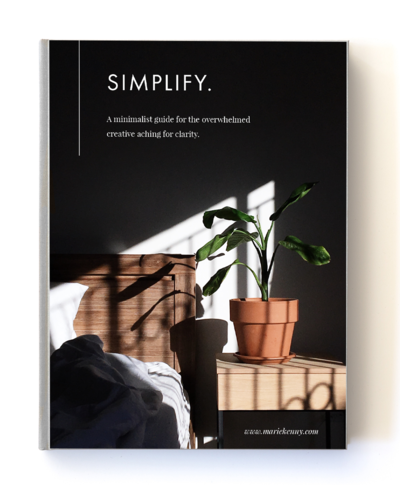 So I decided to save you a few headaches and put the result of a few years of trial and error in a beautiful 45-page practical guide where you'll find tips, journaling questions and thought starters to make your own magical blend of minimalism that works for you and your circumstances. I don't believe in one size fits all - let's make our own rules.